Burnley are hopeful that striker Jelle Vossen will be able to make his Clarets debut at Accrington Stanley tomorrow. And after training following a calf problem, skipper Jason Shackell is also in line for his first pre-season appearance after missing the 2-1 win over Etoile Carouge in Geneva last Friday night. Vossen’s international clearance was pending at the time of going to press, following his switch from Belgian side RC Genk, but the club were hopeful of gaining permission for the 26-year-old to feature in any case against Stanley, as it is not a competitive game. Sean Dyche used the rest of his players in Geneva, as Tom Heaton, Cameron Dummigan, Tom Anderson, Michael Duff, Matt Taylor, David Jones, Lukas Jutkiewicz, Michael Gilks, Matt Lowton, Luke O’Neill, Ben Mee, Stephen Ward, Scott Arfield, Fredrik Ulvestad, George Boyd, and Sam Vokes all got 45 minutes, while Marvin Sordell and Michael Kightly played an hour, and Danny Lafferty and Steven Hewitt an hour and 15 minutes. Michael Keane has had extra time off after his time away with England Under 21s. 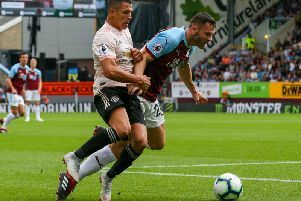 Stanley, meanwhile, are likely to include former Claret Shay McCartan, whose solitary first team appearance came under Eddie Howe as a substitute at Doncaster Rovers in 2012. Accrington won 4-1 at Nelson on Wednesday night with a hat-trick from the returning Sean McConville – one of nine summer signings so far for John Coleman, including 6ft 9ins keeper Jason Mooney.